This image of the International Space Orchestra musicians was taken by Neil Berrett. The orchestra is a project by Nelly Ben Hayoun of the SETI Institute. What do you get when you combine brilliant space scientists with musical instruments? Why, an International Space Opera, of course. 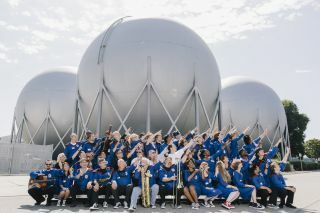 The International Space Orchestra (ISO) is the brainchild of French director Nelly Ben Hayoun, who has the colorful title "designer of experiences" at the SETI Institute (short for Search for Extraterrestrial Life) in Mountain View, Calif. The International Space Orchestra and Beck during rehearsal at Davies Symphony Hall. Image taken by Nelly Ben Hayoun, SETI Institute. "If you want to engage the public with [space science], you can't really do that with a poster," Ben Hayoun told an audience at the South By Southwest Festival in Austin, Texas in March. In the summer of 2012, Ben Hayoun assembled the orchestra using scientists from the NASA Ames Research Center, SETI Institute, Singularity University and the International Space University joined forces. They performed "Ground Control: An Opera in Space," a 27-minuted musical extravaganza that reenacted the drama of NASA's mission control during the Apollo 11 moon landing in 1969. Ben Hayoun directed and produced the space opera, which features NASA Flight Director for the LCROSS and LADEE moon missions Rusty Hunt playing baritone saxophone, NASA Ames Deputy Director Lewis Braxton on the gong and NASA astronaut Yvonne Cagle on percussion. The ISO had their first performance in front of the world's largest wind tunnel at NASA Ames on Sept. 6, 2012. Their second performance took place in San Jose during the ZERO1 Biennial, a showcase of work at the nexus of art and technology. The International Space Orchestra receives a standing ovation at Davies Symphony Hall. Image taken by Nelly Ben Hayoun. The scientists were joined by musical talent Damon Albarn, frontman for the bands Blur and Gorillaz, singer-songwriter Bobby Womack and the famous Japanese art group Maywa Denki, with original music by the band Penguin Café's Arthur Jeffes and lyrics by science fiction author Bruce Sterling and writer Jasmina Tesanovic. Later, Ben Hayoun made a feature film about the orchestra, because otherwise, "nobody would believe that it happened," she said. She filmed the space opera at George Lucas's Skywalker Ranch, where "Star Wars" was developed. In January 2013, the film premiered at the Rotterdam International Film Festival and launched a world tour. "They're never going to be the philharmonic, but that's not the point," one person interviewed in the film observed. The orchestra performed with the singer Beck at San Francisco's Davies Symphony Hall in May 2013, in front of 2,700 people. An mp3 recording of the orchestra was launched to the International Space Station on two satellites in August 2013, which were later released into orbit. This image of the ISO Logo engraved on a Nanosatisfi satellite was taken by Nelly Ben Hayoun. Prominent NASA and SETI scientists have given public talks about the missions that inspired the space opera, among them NASA Ames chief scientist Jacob Cohen, Kepler mission manager Roger Hunter and Director of SETI Research Gerry Harp. At South by Southwest, Tesanovic praised Ben Hayoun for having the courage to pursue the space orchestra. "She's doing dangerous stuff," Tesanovic said. "She's just a young girl, and she's telling 80-year-olds what to do." Ben Hayoun's enthusiasm for space didn't end with the International Space Orchestra. She is currently pursuing informal astronaut training, and her next project is a film called "Disaster Playground" about potential space catastrophes, such as an asteroid impact, and the emergency procedures for handling them.